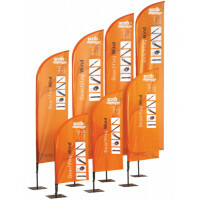 Feather flag banners are effective means of spreading awareness about the products and services of your organisation. 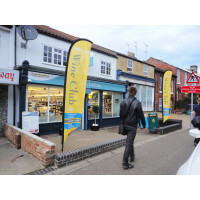 Scribo Displays provide their customers a wide range of feather flag banners that are hoisted on lightweight, sturdy, weather resistant poles made of carbon-fibre that are coated in black. These poles can be assembled easily and are available in three different dimensions. The flags that are used with these poles can be custom-printed according to the customer’s requirements. These feather flag banners with 1-part fiberglass tops can be used with poles attached to wheel bases, water bags, ground spikes and cross bases. The accessories that come with these feather flag banners can be stored in specific compartments that come with black canvas bags. Our portable feather flag banners are attractive advertising equipment and can be set up easily without using specialised tools. It is also easy to obtain permission to position these feather flag banners at different locations. Spare some time to look at our range of feather flag banners, so you can enhance the impact of your outdoor displays.